This month’s design team project for The Piece by Piece is a “No-Sew” fabric cuff. 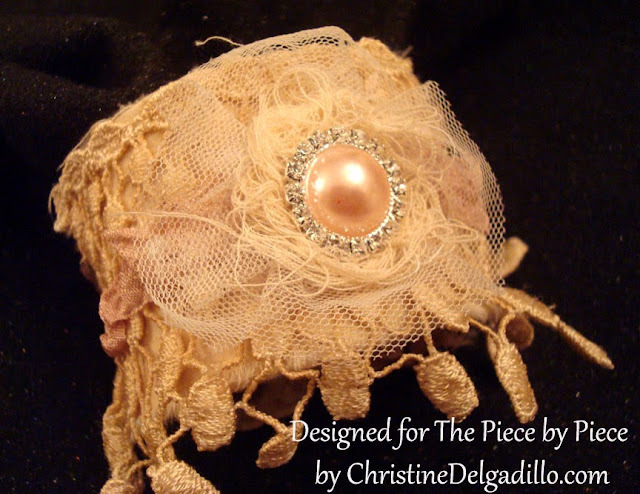 Below is a video of the fabric cuff made from muslin fabric. 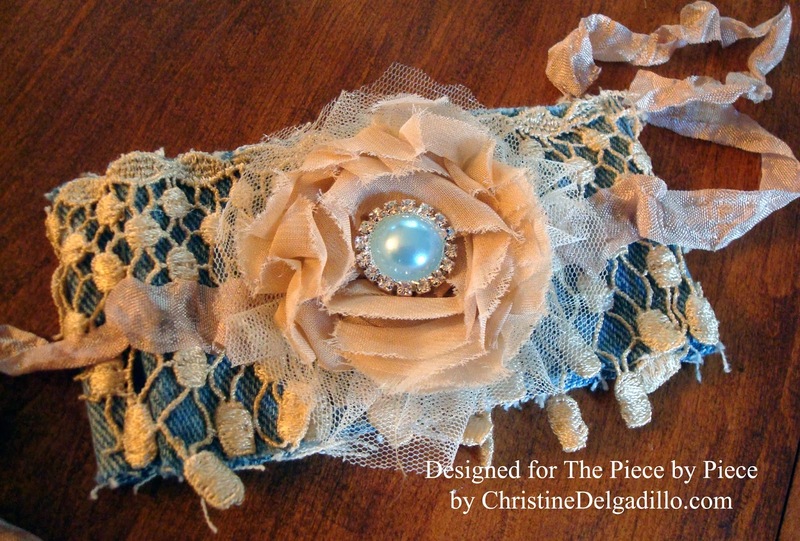 In the video, I also show the cuff made from a pair of jeans, and this blog post is a step-out of how I did that one. It’s basically the same as the muslin cuff, except for the way the fabric is folded, plus this one is quicker because I didn’t coffee-dye the fabric. I started with cutting a 2-1/2" wide strip from a pair of my son's jeans that I retrieved from the donation pile. This strip is ten inches wide. Using my fingers, I roughed up the cut edges of the jeans for a frayed look. Lift the raw edges and apply Fabri-Tac glue to seal the edges of the fabric closed. Put Fabri-Tac glue on the left side of the fabric. I folded the right half of the jeans onto the glued half so that it now measures five inches wide. Put glue on the top solid edge of the Venise Fringe Trim. And to the individual pieces of the bottom part of the trim. And add glue to the sides of the trim. I used 24” of seam binding, crinkled it just by putting it between my two hands and then making a “scrubbing” motion – as if you are washing your hands. I ran a horizontal string of Fabri-Tac glue along the center of the trim. Find the center of the seam binding, and lay it on the center point of the glue on the fabric cuff. Instead of laying the seam binding flat onto the fabric, I scrunched it up a bit before laying it onto the glue. I used Fabri-Tac to glue the pleated tulle down, but only on the center portion so that the ends remain fluffy. 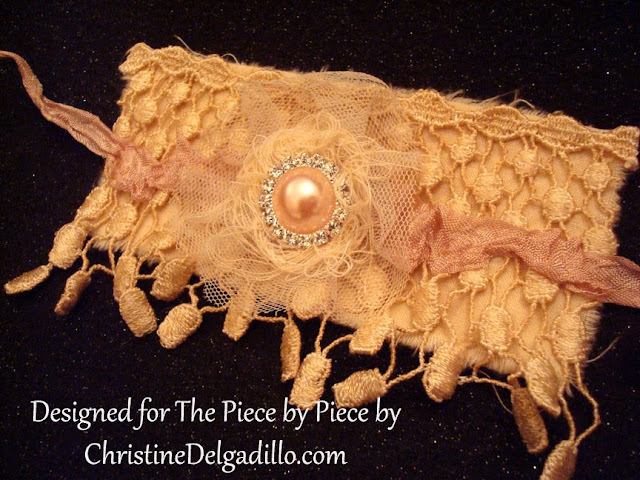 I put Fabri-Tac on the back of the Beige Fabric Flower and placed the flower on top of the pleated tulle. 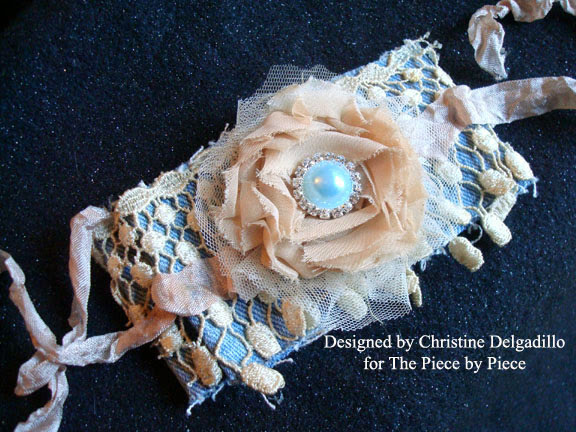 Add a Flatback Pearl with Rhinestone to the top of the flower. 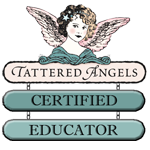 If the tulle is extending too far out from your flower, while the glue is still wet, you can hold down the flower and use a pencil to tuck the pleated tulle in a bit further under the flower. And that’s it – you’re done! I hope you give it a try!